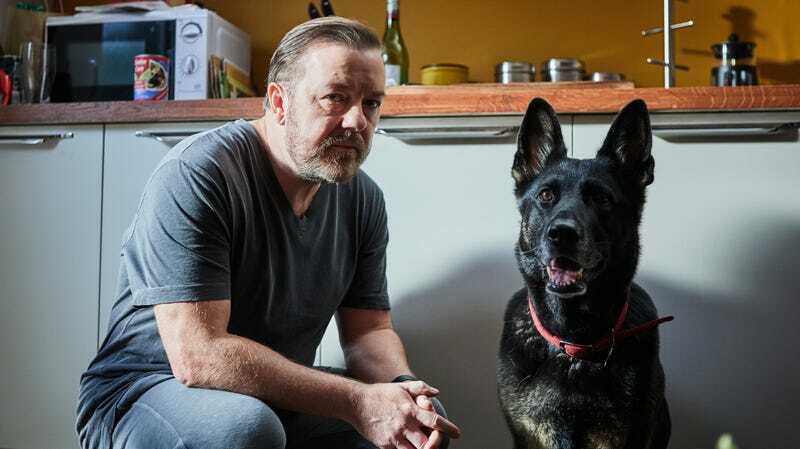 Netflix has ordered a second six-episode installment of After Life, the Ricky Gervais-starring tragicomedy from writer Ricky Gervais and director Ricky Gervais. Deadline reports that the series, which centers on a Ricky Gervais type whose petulant humor and life choices take a darker bent following the early death of his wife, will return sometime in 2020. The ostensible comedy, which comes from the Gervais-run Derek Productions, follows Tony (Gervais), whose overwhelming grief after the death of his wife (Kerry Godliman) leads to suicidal thoughts. Tony views these impulses as a sign that there’s no longer any reason to not do or say whatever he wants, whenever he wants, because he’s willing to end his life whenever he chooses. But while his actions become increasingly reckless and repellent, his relatives and colleagues at the local yokel paper for which he works inconveniently refuse to stop caring about him. Both hijinks and weeping ensue. Tom Basden, David Bradley, Ashley Jenson, Penelope Wilton, Mandeep Dhillon, and Roisin Conaty also star. In a handy tweet-thread Netflix shared on the event of its cancellation of the critically beloved, groundbreaking One Day At A Time, Netflix said that “The outpouring of love for this show is a firm reminder to us that we must continue finding ways to tell this these stories.” That firm reminder must surely have been in the minds of the streaming service’s decision-makers when it opted to give another season to this series. If not for Netflix, who would represent the notably silenced Gervaises of the world? In other news, One Day At A Time continues to search for a new home, since Netflix has reportedly made it damn near impossible for it to land at CBS All Access or any other streaming service.